NEW YORK (CNN) -- A stolen Statue of Liberty replica has resurfaced in a disturbing video posted on YouTube that shows someone decapitating the blindfolded lady and smashing her head into pieces. 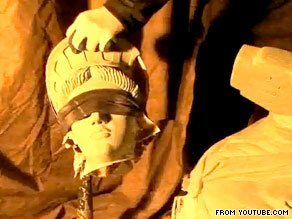 The YouTube video shows a gloved hand sawing off Lady Liberty's head before smashing it. The 200-pound replica was stolen less than a month ago from Vox Pop, a coffee shop in Brooklyn. "It's very disturbing," shop operator Debi Ryan told CNN, adding the video struck a chord similar to that of terrorist assassination videos. "I don't know what it means. ... I don't know who would do this." The YouTube video begins with a waving American flag, and then shows a gloved hand sawing off the head of the statue before crushing it. The slogans "We don't want your freedom" and "Death to America" flash across the screen during the one-minute video, which is dated July Fourth. It was anonymously e-mailed to the Daily News and Ryan earlier this week. Ryan said she's sure the statue in the video is the one stolen from her cafe. "She's unique. I know my girl," she said of the statue. "We just had her completely refurbished, outfitted with a solar torch and painted." Authorities told CNN they are handling the case as a larceny rather than separately investigating the YouTube video. "We want to verify who sent the e-mail with the video and see if they're responsible," police said. A sign on the store, located in Ditmas Park, reads, "Books, Coffee, Democracy," near where the 8-foot replica of Lady Liberty used to stand outside. The self-described community coffee shop is also a bookstore and a spot for artists and performers. "We've created a space here that's owned by the community," Ryan said. "We're all about freedom of speech and freedom to be who you are and say whatever you think." But Ryan doesn't consider the YouTube video featuring her stolen statue appropriate free speech. "Vox Pop stands for freedom of speech. You don't get to steal somebody else's property to send that message. We have to respect each other," she said. Although the coffee shop recently faced economic problems and neighborhood tension, the motive behind the statue's theft remains unknown. As for whether there will be a replacement statue, Ryan said, "I'm hoping. I think she belongs here. But she added, "Whether we have a physical statue or not, what she stands for remains here."